In a no spin throw, the knife does not spin at all (or very slowly for ¼ rotation), the knife tip always facing the target, and thus always sticking. Thrown in the traditional overhand style, a thrown knife spins end-over-end in flight, because it continues your circular throwing motion. You have to learn just the right throw for your current distance, or your knife will not reach the target tip first, and thus won't stick. These multiple spin throws are employed by the majority of sport throwers. Martial arts. You practice it as part of your journey to master your body, mind, and specific weapons. Self defence. Defence not practicable in real life. You are lazy and don't want to count spins or guess distances. Instinct. The immediacy of going to any distance, throw the knife, and just stick it. History of the "Slow spin"
For several hundred years, the martial art schools of Japan practiced the art of shuriken-jutsu - shuriken meaning "hand hidden blade". These blades were used for throwing, thrusting, or cutting. Incorporating influences from China, Tibet, and India, the schools however made their knowledge only available to their own students. Throwing wise, of greatest interest are the spike-like bo shuriken , which were taught to be thrown in a no spin style that utilised much pushing. There is a world map of no-spin knife throwers maintained by Ryan Moomaw. In the modern days of knife throwing, the multiple spin throw was the only method practiced. To exemplify, in 1973 Harry McEvoy made a journey to Pennsylvania, to witness Richard Crist throwing knives in the no spin style. McEvoy returned convinced that throwing without spin is possible, but was unable to reproduce the throw [McEvoy 1973]. 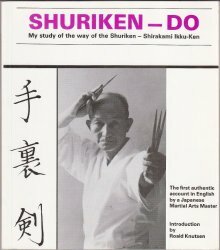 Via books like "Shuriken-Do" [Shirakami Ikku-Ken 1987], the no spin knife throwing seeped into the consciousness of western knife throwers. But twenty years later, the knowledge seemed to have vanished again: In the first years of this millennium, Roy Hutchison from London had to travel in person to the USA to demonstrate his no-spin throw. Only after blindfolding him and having him throw at various distances unknown to him, the throwing community there could be convinced that a throw without spin is possible. Hybrid styles between no spin and natural spin (one rotation about every 2m) knife throwing have of course also existed, and gained the moniker "slow spin", for example advocating one spin at 5m, or stating that "When throwing a knife, it must make only half a revolution from hand to target" ([Brad Bayler 1987], p. 73). A snapshot of the popularity of no spin knife throwing: In the 2014 World Championship in Knife- and Axe Throwing, for the first time (and on a trial basis), an "instinctive throwing" event had been added that allowed only no-spin or half-spin throws. Participation was rather low, only 23 throwers competed in this event, equal to just 16% of the World Championship's participants. Geographically, half of the no spin throwers were from Russia, where this style is practiced since some decades under martial arts aspects. If you use one of the "cheater" no spin throwing knives (see below) like the Gyro, no spin knife throwing is easy: Those knives are specially constructed so that no skill is required for them to fly without spinning (think spear or dart ). If you are serious about learning to throw no spin, no special gadgets required, you'll be choosing one of the following three no spin styles. Patrick Brewster demonstrates the different no spin styles and highlights their differences in a short video. All three styles use an almost identical grip, the so called "finger of god", with the index finger resting on the spine of the knife (see photo) - this does further slow down the rotation of the knife. The alternative style where the index finger rests exactly on the center of gravity is to be preferred by throwers who already command the traditional spin throwing method. 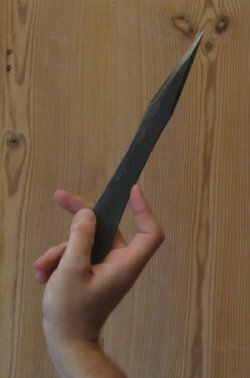 Do note that, in reality, past 3.5m Thorn style knife throwers are hybridizing into a more shuriken or Fedin no spin throwing style. A warning: No spin knife throwing is quite a strain on the joints. Don't throw for too long! If the no spin throwing is freaking you out at first, take it slow and try half spins instead. Brian T. Sload demonstrates how to do half spins from 4.5m. To throw knives no spin, the formerly secret styles to throw the bo shuriken work just fine - says David Fletcher ([Fletcher 2011], p. 74), who trained at the Meifu Shinkage Ryu Dojo in Japan. One variant, Mumyouan style (Japan), uses a locked wrist, with a sort of pushing or shot put release, and works best with small weapons, especially shuriken spikes, and from long range because the flight pattern is more of a true quarter spin. Book Japanese Throwing Weapons by Daniel Fletcher [Fletcher 2011], chapter Throwing practice, p. 30ff. How to throw shuriken, extensive article by the late Jason Wotherspoon. Mumyouan style throwing videos by the late Houzan Suzuki. Our detailed article on The energy of two waves, written by Yury Fedin himself. Videos in the Fedin Master channel. Videos of Sergey Fedosenko (world's best no spin knife thrower, from the Moscow Freeknife club). For example метание ножа ("knife throwing"), or fun throwing in the Knife video. Video of relaxed no spin throwing at Russian blade show. Video of TomTom from Germany showing the Fedin moves. The core elements of the throwing styles can of course be combined. Find pointers for constructing your own throwing style in TomToms one hour video tutorial on no spin knife throwing. The characterisation of the three no spin throwing techniques is based in part on a Fedin style discussion, with valuable insights by eRalphThorn, Rob Windwhistler, and Edward edojan. This alternative no-spin throwing style is based on the principle that the index finger rests exactly on the center of gravity of the knife. In the throw, the index finger draws the knife to the target in a straight line - thus preventing a rotation of the knife. The concept of this no-spin throwing style is simpler than Mumyouan or the other techniques described above, and much closer to traditional spin throwing. If you are accustomed to throwing with rotation, you'll quickly be able to throw no-spin with this center of gravity technique (following TomTom's instruction video, it only took me two days to learn). You hold the knife very loosely for the throw: Locate the center of gravity (pro tip: mark it), and it is exactly here that you will place your fingertip on the spine of the knife. Thumb and middle finger only stabilise, but don't grip the knife (see photo). Now put your throwing hand beside your head, with the forearm being parallel to the ground. Bend your forearm back a little more. Now use your index finger to draw the knife towards the target, always feeling the weight of the knife on your fingertip. Continue the motion even once the knife has left your hand! Because you are drawing the knife to the target at the center of gravity and in a rather straight line, it will not rotate - or only slowly. Since you want it to stick when it reaches the target, you give the knife a very slow spin by putting your index finger not exactly on the center of gravity, but a tiny bit to the front. This tiny displacement will vary by the distance to the target, and you need to develop a feeling for it. Watch TomTom's training video to see more details of the throwing motion, and learn exercises that help you eliminate any rotation. This no-spin technique works well with lightweight knives, but can be used to throw all kinds of throwing knives no spin (video). The special Gyro Dart throwing knife is thrown using basically the same technique. But it makes your life even easier, because the tip of the knife is already always pointing to the target. The underhand no spin knife throwing technique is in a different league than the three no spin styles explained above: it's quick to learn, fun, but only suitable for heavier knives at close distances (say 3m to 5m). And please don't expect to get accurate with it, ever! You place the knife in your palm, tip facing outwards, the centre of gravity of the knife being in the middle of your palm, your thumb lightly pressing the knife into the palm. Index finger and middle finger can be outstretched along one side of the blade, supporting it. Starting with your arm hanging, knife pointing towards the ground, you push your hand forward. Quick movement is key (bending the right knee like in bowling can help). With some practice, you'll be able to stick the knife in a (suitably large) target using this "surprise" throw. See also [Gérard Lecœur 1998], chapter Le lancer sans rotation, p. 68f, and the uppercut style in [Ralph Thorn 2008], p. 52ff and p. 109. No spin throws will generally be less accurate than throws with spin, because the rotation stabilises the flight. Also, in no spin throws the mental focus is on the flight and not so much on the target. Two arguments to back up this claim: In the World Championship in Callac, in the precision throwing events (3m to 7m), all knife throwers participating elected to use spin throws - even though some of them are excellent no spin throwers. And in his learning curve case study with hefty negishy-ryu bo shuriken, Amante Mariñas found that (at 5.5m distance), it took him 8 months to achieve good accuracy using no spin throws, while with two spin throws (and slightly larger bo shuriken), he was nearly perfect in the first month ([Amante Mariñas 2010], p. 97). I call those throwing knives "cheaters" because they don't require any skill. They are constructed so that the tip will always point forward in their flight, thus always sticking. Not surprisingly, such knives were banned in the instinctive no spin competition at the World Championship in Callac. 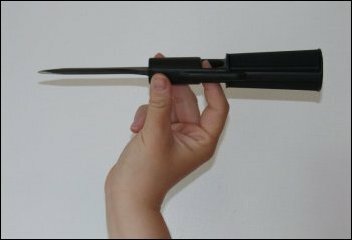 Examples are the Easy-Stik Pro, which is basically a large dart, and the Gyro knife (see photo), which is thrown like spear, with your index finger resting in a special hole in the handle and acting as sling on release. The three widespread no spin throws explained above (Mumyouan/Thorn/Fedin) all use special no spin throwing knives for their style. The common feature is that the knives are elongated and sleek - remember their origin, the bo shuriken spikes. The most important difference is where the knife's centre of gravity is when you hold it - in your palm, at your fingertips, or even beyond. 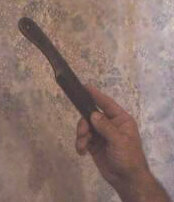 The black "Northwind" (see picture above) is a very modern no spin throwing knife. It is manufactured by hand in the USA by Patrick Brewster of FlyingSteel. The edges are precision chamfered, so your index finger will rest comfortably on the spine with a feeling. With its 235g, it's perfectly suited for novice no spin throwers - and the German steel makes sure they'll still be using it as experts later. 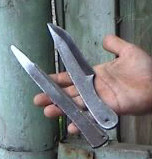 In the wave throw, for example the two Russian no spin throwing knives "Vjatich" and "Osetr" (see photo) are employed. The beautiful couple of silver-white no spin throwing knives below were constructed by Roy Hutchison, an inventor from London. Read about the no spin throw and half spin throw that those knives were made for. In Japan, throwing knives fall into the teppan shuriken category (which contains all blades made from sheet metal, compare [Fletcher 2011], p. 74ff. ).